Other species include Pimelea ferruginea (pictured right) which is from Western Australia with attractive pink flowers, and the popular Qualup Bell or P. physodes which has bell like flowers. P. linifolia is a different form and also sometimes referred to as rice flowers, these are found in the Eastern States. P. Rosea is a great long flowering garden plant, a well drained position and full sun (pictured below). Lots of named cultivars are finding their way into nurseries, we are not sure if they are much of an improvement on the species in some cases, however do look for grafted varieties. 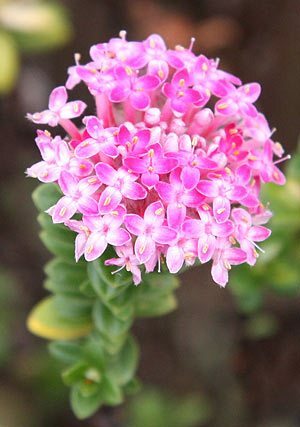 As garden plants Pimelea will require different attention depending on the species. All of the Western Australian species are best grown as grafted plants in the eastern states. They all require excellent drainage and good sun. We have found them to be hardy in the cool Dandenong ranges given good conditions. Fertilize all species only with a weak dose of native plant fertilizer. We have found that most species can be pruned as long as you do not cut back to hard into old wood. Pimelea nivea or round leafed rice flower has interesting foliage.